••• Pallet Repair Systems, Inc. The pry bar is the popular tool for removing pallet boards without automated pallet disassembly equipment. 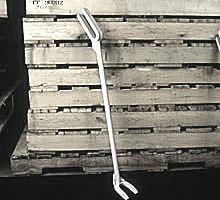 There are two commonly used pry bar styles, the duck bill, and the double fork. The duck bill is best suited for moving the lead board from the edge of the pallet without breaking the wood during removal. The double fork pry bar is used to remove interior deck boards. Its effectiveness is predicated on the heel of the bar resting atop the stringer, and then through the application of leverage, the forks move up under the next board and pry it loose from the stringer. The addition of a stationary air compressor is needed to power the pneumatic equipment typically found in a pallet repair shop, including nailing tools, chop saw, and other machinery. It should be powerful enough to meet the needs of the pneumatic equipment demands of your business. Piston-style, oil-free air compressors are now very popular. These should eliminate the need to maintain an oil level in the device, but check your operation manual to be certain. Maintaining air supply is critical to your business. With this in mind, be sure to meet the daily, weekly, monthly and bi-annual maintenance requirements of your unit. For a pallet repair operation, pneumatic nailing equipment is a must for anything beyond the most simple repair. For a basic hammer, go for a heavier weight model such as a framing hammer to drive in nails, especially in hardwood. For pneumatic nailing tools, it is possible for larger operators to minimize cost by purchasing their own tools and nail supplies. Other companies, especially smaller ones, take advantage of nailing tools that are supplied and maintained by the nail vendor in return for purchasing nails from that company. The pallet repair workstation is designed to improve the ergonomics and efficiency of pallet repair work. The simplest pallet repair tables allow the repair worker to perform his work at a reasonable height, thus reducing fatigue and strain. Tables with a rotating top can allow the worker to spin the table to access the other side of the pallet more readily, and reducing the need to stretch out. Alternately, the table may have a high point that facilitates the operator spinning the pallet. The pallet repairer will be benefited by immediate access to tools and supplies. For example, overhead balancers can be used to assist in usage of nailing and stringer plating tools. Likewise, having replacement components neatly organized and close at hand will minimize travel time and delays during the pallet repair process. The workstation design should also promote ease of pallet presentation and removal. This involves the evolution of the basic repair station into a pallet repair system. In basic shops, the worker may lift pallets to and from the repair table, and place waste wood into a bin, but with an improved design, pallets to be repaired may be presented at slightly above table height, and slid down onto the table. This can be accomplished by having the stack of pallets on a powered lift table, or presentation from a conveyor. After repair, pallets can be slid onto another conveyor for stacking, or stacked onto rollers for removal, while waste wood falls onto a waste conveyor for wood grinding. Higher volume recyclers may choose to install automated repair lines that offer such benefits. Trim saws are important in cutting down dismantled pallet components and other pieces of new or recycled lumber that will be used to repair pallets. Trimming of recovered lumber helps avoid the need for new pallet repair parts, therefore reducing the cost of repair. Chop saws are useful for cutting stringers into shorter lengths for pallet stringer repair. A preferable method of stringer repair is with a plater. Steel plates can be rapidly and inexpensively affixed to the sides of the stringer where it is cracked, thus eliminating the need to remove the damaged stringer, or the addition of a companion stringer. Some platers are stationary, while others are handheld, used in conjunction with a balancer.